Why is it so important to keep blood sugar level where it should be? When we consume a diet of mainly fresh fruits and vegetables, as well as other whole, natural, unprocessed plant foods, we tend to have much better blood sugar control than those who eat more processed foods and high fat animal foods. We set the stage for many diseases when our blood sugar level becomes too high. Two factors affect this condition – first is the blood sugar itself, known as glucose, and the other is from high levels of the hormone insulin, which the body produces and releases into the bloodstream in response to high blood glucose levels. When a high level of glucose is in our bloodstream, it interacts with various protein structures, such as those lining our artery walls. These structures become "cross-linked" as a result, causing them to become stiffer and less flexible than they once were. As a result of this decreased flexibility, the arteries now do not work as well as they should. When our artery walls become stiffer and less flexible, this is thought by many to be a contributing factor to high blood pressure. When the protein structures of our skin (collagen) become cross-linked, we are more likely to develop wrinkles and stiffer skin. And so it goes with many other structures of our body. We definitely do not want our glucose and/or insulin levels to get too high in the bloodstream because they tell the body to make and store fat, as well as damage blood vessel walls. An excess of fat, especially saturated and trans fats found in animal products and processed foods, are a major cause of insulin resistance. When the overall level of insulin in our blood rises, we start to have the problems of excess insulin mentioned above. 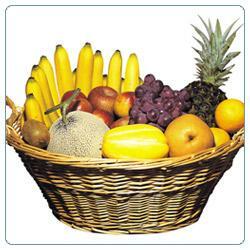 Fresh fruits and vegetables, and other whole, natural, unprocessed plant foods have an abundance of dietary fiber. This helps keep our glucose and insulin levels where they should be. Whole, natural, unprocessed plant foods are also, in general, very low in fat. Excess body fat is another major factor in insulin resistance. The high fiber, low fat characteristics of whole natural unprocessed plant foods means they are also low in calories, which helps us keep our body fat at lower levels. Eating a raw diet has many benefits, and these are just some of them.